There was a time when 1983 Topps Traded Baseball was one of the most popular sets in the hobby. Times have changed and careers didn't pan out as expected, but the set still has a strong following. 1983 Topps Traded Baseball has the same classic design as the flagship 1983 Topps Baseball. Card fronts have two photos, a large action shot on top and a small circular portrait inset in the nameplate. Because 1983 Topps Baseball didn't have multi-player rookies, the box set has several first cards. This helped raise its profile and make it more desirable. 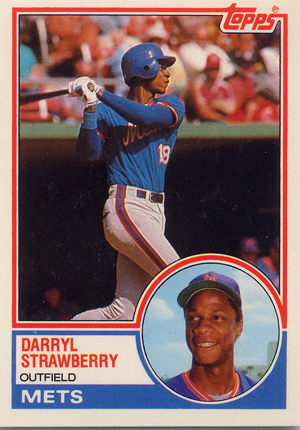 The best of these rookies are Darryl Strawberry and Julio Franco. Around the time of the set's release, Ron Kittle was one of the hobby's most popular cards. Obviously, Kittle's star didn't reach the expected highs and the card shrunk back to novelty status, mentioned alongside other failed prospects like Todd Van Poppel and Kevin Maas. 1983 Topps Traded Baseball is a 132-card set. It wasn't available in packs. Like other Topps Traded sets, it came as a box set. Cards are numbered 1T to 132T. 1983 Topps Traded Baseball Set. (132) Unopened. Factory Sealed! Original buyer. JULIO FRANCO 1983 TOPPS TRADED #34T ROOKIE GRADED GEM MINT 10! Jesse Barfield Topps Rookie Lot 1982 Traded 2T 1983 1984 1985 1986 PSA? Fernando Valenzuela Topps Rookie Lot 1981 & Traded 1982 1983 1984 Mint PSA?